Marion Davies has been much and long-maligned, her reputation all but ruined due to 'Susan Alexander', the character in Citizen Kane alleged to be based on Davies. The idea that Davies was a talentless drunken harpy in real life has seeped into Davies the actress and Davies the person. The truth, if you see in Davies' films, is that she was a sparkling, charming comedienne, who lit up the screen with a jolly, jaunty manner. Unfortunately, her benefactor, media tycoon William Randolph Hearst, did not care for comedies. He preferred lavish epics and costume pictures. Thus, we have Davies in When Knighthood Was in Flower, a slow, sometimes quite dull enterprise where Davies still livens things up when she plays to her talents: humor. Mary Tudor (Davies), sister of King Henry VIII (Lyn Harding) is using her as a bargaining chip to cement an alliance with France by offering her as the bride of King Louis XII (William Norris). There are a few problems, however. One: Old King Louis is about a thousand years old (actually, he was 34 years her senior, making him 52 to her 18 at the time). Two: Mary has fallen in love with a ordinary knight, Sir Charles Brandon (Forrest Stanley). Three: Mary, a feisty figure, will constantly defy the King on this matter through a mix of outright anger and sweet appeals to family. After endless hemming and hawing, Henry insists on the marriage. Mary and Charles make a run for it in an effort to flee to New Spain, requiring our Princess Royal to dress as a boy. This Drag Race fails, and eventually she consents to the marriage on the promise that she can choose her second husband, an offer Henry agrees to. As a gesture of goodwill, he stops Sir Charles from being beheaded. Off to France to make Louis happy, but there is trouble brewing. Louis' heir, the Duke Francis (William Powell, here as William H. Powell), has designs on our fair maiden. She obviously does not want to swap husbands, but Francis will not be denied. Louis finally dies and in comes Francis. It is only through the daring rescue of Mary by Charles and his loyal friend, Sir Edwin Caskoden (Ernest Glendinning) that she escapes Francis' clutches. Now back in England and in Court, Henry has a surprise for the widowed Queen: King Francis wants to marry her! Reminding him of his promise, Mary coyly remarks that such a marriage would not please her husband: Sir Charles. Cardinal Wolsey (Arthur Forest) sadly reminds the King that he did give Mary choice for her second husband, and when told that a Princess of the Realm cannot marry a commoner, she offers a solution: make Charles the Duke of Suffolk. With that technicality taken care of, Mary and Charles are now free at last to love, with Henry commenting that if she had gotten her way in the first place, none of this would have happened. It's a shame that history could not have moved faster, otherwise we could have had a shorter movie. If there's one thing certain with regards to When Knighthood Was in Flower is that it is, if nothing else, lavish. The title, based on a novel by Charles Major, is already grandiose. Even the title cards read as flowery. Sample lines: "They were strong only in the strength of youth and in the right of youth to love" and "A girl's wit and daring against the will of the King". My favorite title card read "King Louis is determined to show his young Queen that he is a gay and romantic youth," a line that has some pretty funny connotations if misread. I find such things rather overblown, but that's just me. What is curious about When Knighthood Was in Flower was that Davies played so much of it as if it were a comedy. Over and over again there were scenes where things are played almost for laughs. Of particular note is when she is in drag, her efforts to try to pass herself off as a man light and amusing, clearly performed as we were in on some joke. While it does show her to be a bright and amusing comedienne, it does undercut the very serious and sweeping nature When Knighthood Was in Flower was aiming for. At times, the lavishness of it all drowns the story, such as it is, into near-tedium. The movie is only about two hours long but feels so much longer. You wish the entire struggle to get her to the church on time, which probably took if not the whole first hour maybe more, could have been shortened. Moreover, there was nothing to keep people in suspense when it came to Charles' close shave. Maybe because we figured, even without having deep knowledge on Tudor family dynamics, that he would live. However, we're supposed to believe that there is a wild rush to save him, even to where the Court Jester goes to delay the beheading. For me, I felt no tension. I think Davies could have been a good dramatic actress even if she seemed much better in light comedies (like in Show People). She probably could have done more if she had a stronger director than Robert G. Vignola, who allowed her to play things for laughs and who couldn't pace just about anything. She did have some good moments, such as when Francis is making leery eyes at her. Vignola also had good visual moments, such as when Mary visits a soothsayer or when she prays, two beautifully filmed images. It's just about everywhere else that When Knighthood Was in Flower flops. There are some exceptions. Harding's King Henry VIII was made a bit of a fool (Mary almost always managing to get her way) but he could be commanding when needed. Norris' tottering Louis XII was a comic performance, but a good one (even if he made Louis look close to a hundred versus the mere 52 that he was). It's also interesting to see William Powell, that symbol of suave, debonair sophistication as the leering, sleazy Francis. He is perfectly sleazy to where you do think he is a most dangerous figure. Sadly, Stanley's Charles was nice-looking but bland, and certainly not the swashbuckling figure the film needed. Somehow, his version of Charles Brandon was weaker than Henry Cavill's version in The Tudors...and Cavill simply can't act! The restored version has a score by Ben Model, which includes two songs written specifically for the film when it was first released: When Knighthood Was in Flower and The Marion Davies March, neither of which I imagine have endured the test of time. 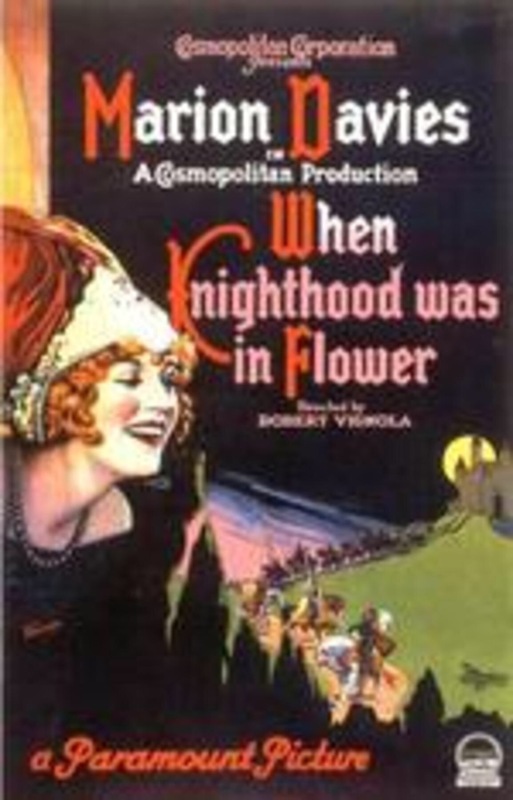 Model's music was well-written, but I suspect that no one now, not even the 317 Marion Davies fans who through Kickstarter financed the restoration of When Knighthood Was in Flower, would know where those two themes were. Both of these songs were written by Victor Herbert, no slouch in the music department, so Hearst really went all-out for his mistress. As a side note, Herbert would play a part in Davies' life again, when Hearst financed The Red Mill, one of Herbert's operettas, as a vehicle for Davies. I suspect though that The Red Mill was, like When Knighthood Was in Flower, more a reflection of Hearst's tastes than a well-thought plan to further Davies' her career. It's almost as if Hearst wanted the public to bend to not just his mistress as star, but to his own tastes despite the public preferring Davies where she really shined: as a comedienne. When Knighthood Was in Flower is as pompous as its title. It's good for Marion Davies fans, and it does show she had range. It also shows that her forte was not in lavish costume melodramas and romances. In a sense, perhaps you do kill the thing you love.